↑ Centre Historique des Archives Nationales, Paris, AE II 2490, dated to the second half of the 15th century. 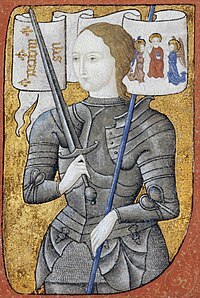 "The later, fifteenth-century manuscript of Charles, Duke of Orléans contains a miniature of Joan in armour; the face has certain characteristic features known from her contemporaries' descriptions, and the artist may have worked from indications by someone who had known her." Joan M. Edmunds, The Mission of Joan of Arc (2008), p. 40. ↑ "Chemainus Theatre Festival - The 2008 Season - Saint Joan - Joan of Arc Historical Timeline". Chemainustheatrefestival.ca. Retrieved 30 November 2012. ↑ ତାଙ୍କ ନାମ ବିଭିନ୍ନ ପ୍ରକାର ଲେଖାଯାଉଥିଲା, ବିଶେଷତଃ ଉନବିଂଶ ଶତାବ୍ଦୀ ପୂର୍ବରୁ । ତାଙ୍କ ଦସ୍ତଖତରେ ଜେହାନ ଲେଖା ଥିଲା (see www.stjoan-center.com/Album/, parts 47 and 49; it is also noted in Pernoud and Clin). ↑ Modern biographical summaries often assert a birthdate of 6 January for Joan, which is based on a letter from Lord Perceval de Boulainvilliers on 21 July 1429 (see Pernoud's Joan of Arc By Herself and Her Witnesses, p. 98: "Boulainvilliers tells of her birth in Domrémy, and it is he who gives us an exact date, which may be the true one, saying that she was born on the night of Epiphany, 6 January").